Technological revolutions seem to take about half a century to reach maturity. It was roughly 50 years from Einstein's Special Relativity paper to nuclear power, from the Wright Brothers to commercial jetliners, and from the first electronic digital computers to the Internet. It was also roughly 50 years from Tsiolkovsky's work to Sputnik, and from the first liquid fueled rocket flight tests to Apollo 11. The double helix structure of DNA was discovered in 1953, the human genome mapped in 2001, and genomics is now the hot field in commercial biotech. Going back, it was (exactly!) 50 years from Watt's steam engine of 1775 to the first steam railroad, the Stockton & Darlington of 1825. The first oceangoing steamship was 1819-1833, depending on how you qualify it. Going even farther back, to a preindustrial tech revolution, the first known progenitor of the classic full-rigged ship, with three masts combining square and fore-and-aft sails, is apparently dated to 1409, and that rig was standard for large ships before c. 1475. I don't want to make too much of this, and maybe nothing much can be made of it. Perhaps I am cherry picking my facts and their interpretation. For airplanes the jetliners of the 50s marked a broad technical maturity; most of the world's jetliners look and perform more or less like the Boeing 707 in spite of a great many refinements (and a revolution in avionics). For railroads the Stockton & Darlington was only the beginning, while steam riverboats became practical 30 years after Watt, and soon were widespread. What of space travel? The 1960s Space Age marked the maturation of a technology pioneered early last century. We are now at the another 50 year mark - but the basic technology of space rocketry is already mature. Like jetliners, our space boosters have the same basic form they had 50 years ago. Progress since then, as with most mature technologies, has been gradual and incremental. The Shuttle, like the Concorde, turned out to be an economic overreach. Enormous progress in electronics and cybernetics has allowed robotic missions to do things hardly imagined in the rocketpunk era, but it hasn't made it any cheaper to loft heavy payloads – like us and our life support – into space. Carbon nanotubes were apparently imaged by Russian scientists as early as 1952, but their Columbus moment – the time when they stayed discovered - was 1991. For elevator fans this might suggest maturation of the technology before midcentury. Unfortunately, even if cables capable of extending down from orbit are possible by then, all the 'secondary' problems of running trains up and down them remain to be solved, with no obvious magic bullets in sight. But speaking of trains … what happened to railroading technology after the Stockton & Darlington showed that it was viable and practical? It underwent the usual course of mature techs. A building boom ensued, along with a host of refinements that gradually improved performance. By around 1900 some trains were hitting 100 mph (~160 km/h, for you purists out there), and 50 mph overall route speed became the expected standard for express trains. Neither electricity nor dieselization really changed this – in the US, for essentially political reasons, Amtrak trains generally run slower than their predecessors of 50 years ago. To all appearances, railroads were a fully matured technology by the middle of last century, with all practical performance improvements already squeezed out of them. Improvements in 'secondary' characteristics such as train loading and scheduling (piggyback freight and unit trains) might provide dramatic improvements in cost efficiency, much as containerization revolutionized oean shipping. But no one expected trains, in their familiar form, to run much faster – hence the rocketpunk era's fascination with monorails, a marvel of hype if not performance. Then an odd thing happened. Trains started to get faster again – a lot faster. Japan built its bullet trains in the 1960s, but they got only limited attention, perhaps because Japan was not a major tourist destination. Then France, which is a major tourist destination, built the even faster TGVs, and now 125 mph (200 km/h) is regarded as pretty much the low end of fast train travel. No tech revolution in the usual sense was involved. TGVs are not obviously different in appearance, or basic technical features, from streamliners of the 1930s. They run on conventional tracks – but the specialized TGV lines are built with extreme care, and with extremely gentle curves to permit continual high speed running. TVGs, and their Japanese predecessors, came about essentially because other modes of transport were hitting their own practical limits, and people were willing to make a major investment to get the most out of trains. Space, I believe, is in broadly the position of railroads 50 years ago. It is a mature, established technology that meets existing requirements – such as the current, limited traffic demand – quite well. The commercial satellite industry can afford $100 million expendable launchers, and has no interest in spending $100 billion in development to make individual launches cheaper. As to what might bring this revolution about, I haven't a clue. But it is worth keeping in mind that we don't need a basic technology revolution for cheaper space access. (Though one would be nice!) What we need is simply a reason to develop something that will cost a lot to get started, but requires only refinement of known techniques – and a demand for lots of space lift capacity. Related links: The US might actually join the modern rail era. And I proposed revising the rocketpunk-era vision of space for this century. Of all seriously proposed space concepts, the Orion drive most lends itself to organ music and black capes with high collars. It invites the question, "You want to launch yourself into space by setting off hundreds of WHAT?" (For those of you not familiar with this remarkable concept, the answer is 'atomic bombs.') The chief potential advantage of Orion is that it combines enormous thrust with high specific impulse – the only space drive able to achieve 'torch' performance without invoking technomagic. The chief disadvantage is left as an exercise for my readers. Even a launch site was proposed, with a colorful if awkward name: Jackass Flats, Nevada. But growing public doubts about atmospheric nuclear explosions doomed Orion, and the 1963 test ban treaty nailed shut the coffin. Of course it walks among the undead in the science fiction and space geek communities. Not the least of its appeals for its fans, I suspect, is its sheer political incorrectitude – no great surprise that Jerry Pournelle is a leading proponent. Whether it would work in practice remains unanswered, and is likely to stay that way for some time to come. Building a spacecraft, even a massive one, to stand up to repeated self-nuking could be a significant engineering challenge; likewise smoothing out the bumpy ride. Concept sketches show Orion sitting above its pusher plate on what look like enormous automotive shocks, described by Wikipedia as 'one of the most difficult design features.' To solve the lesser problem of popping bombs out the back at regular intervals, the designers apparently consulted the Coca-Cola company, which knew something about dispensing machines. What leads me to write all this, however, is something I only discovered yesterday – that the concept was inadvertently tested in 1957, a year before Project Orion formally commenced. It happened during Operation Plumbbob, a series of nuclear tests at the Nevada Test Site. Plumbbob later became notorious because after one test, 'Smoky,' more than 3000 GIs performed maneuvers near Ground Zero. People in the 1950s were cavalier about radiation. But our concern here is another test, 'Pascal-B,' set off a few days earlier. Pascal-B was the second-ever deep underground detonation of a nuclear weapon. Like its predecessor, Pascal-A, it was a safety test intended to produce only a minuscule nuclear yield, about 1 kg TNT equivalent. Instead it delivered nearly a third of a kiloton. But what makes it noteworthy is the unknown fate of a steel plate that plugged the shaft. Physicist Robert Brownlee, in charge of preparations, thoughtfully considered the possibility that Pascal-B would deliver more – lots more – than its intended yield. Among other things he calculated the shock wave that would move up the 500-foot shaft when instruments just above the test 'device' were vaporized. At the top of the shaft was a cap plate, reportedly four feet in diameter, four inches thick, and weighing about a ton. According to Brownlee's calculations, the cap plate would be blown off at a modest 56 km/s. A high speed camera was duly positioned to film the liftoff of the plate. It was not quite high speed enough, because the ascending plate was only caught in one frame of the film The speed and field of view of the camera are not reported, so the minimum speed cannot be determined, but Brownlee described it as 'going like a bat.' Well, yes. I imagine so. But how far did it go? Did the US send an impromptu Orion mission into space more than a year (oops!) month before Sputnik? Alas, probably not. Even if it was still intact when filmed during its unscheduled launch, atmospheric deceleration would have its say. Meteors of that mass are fully decelerated by passing through the atmosphere and 'simply end up as a falling rock.' But wherever it went, what a spectacular way to go. Related links: Naturally Orion is discussed in more detail at the Atomic Rockets site. And I previously blogged here about the broader significance of nuclear weapons. ELEVATOR. A popular and fairly widespread means of providing access to Space, primarily from Habitable Planets. Alternative Techjargon is Beanstalk, and a variety of less common terms. Elevators were unknown in the Golden Age, though the basic idea was - like everything else - first proposed by Konstantin Tsiolkovsky as early as 1895 CE. In the Golden Age the usual means of surface to orbit transit was via Shuttles. But the excessive cost and discouraging safety record of this technology, at least in its first incarnation, has led Planets around the Known Galaxy to look for something simpler and cheaper. And what could be simpler or cheaper than building an elevated railway viaduct 40,000 km long, turning it on end, and anchoring the upper terminal with another 20,000 or so km of cabling attached to a counterweight? (Carbon nanofibers are helpful in this regard.) Add the inherent coolness of trains and it is easy to see why rail rapid transit has become a popular means of getting into Space and back. Given the length of the line, presumably sleeping car accommodations will be made available, giving Elevator travel an elegance quite lacking from the Chicago L or even the TGV. Planners of new Elevator systems should be advised, however, that like much else in Hard SF, the fashionable lifetime of Elevator technology could turn out to be limited. In a couple of decades your shiny new Elevator could end up as a quaint, turn-of-the-century transit system, with theadbare seats in rickety cars that no one wants to ride anymore. If you are lucky it will be viewed as charming, like San Francisco's cable cars, though only tourists will actually ride it. If you are unlucky your Elevator will go the way of the Pacific Electric and be abandoned and torn down – perhaps to be replaced a generation or two later, at enormous expense, by essentially the same technology in a shinier form. Related Link: Once before on this blog I chopped away at Beanstalks. In 1492, Columbus set out for 'Cipangu' and the Spice Islands. He never got where he was going, and never knew what he had found. In 1969 we went to the Moon and discovered Earth. Voyages of exploration are funny that way. This should not have come as a surprise. A classic trope of travel literature is that wherever you go, what you truly discover is home, because only by going elsewhere can you place home in context. There and Back Again was Bilbo Baggins's name for the book we call The Hobbit, and as discussed in a comment thread last month, the true culmination of Lord of the Rings comes where its journey began, in the Shire. So it is no accident that the first Earth Day was in 1969 – a few months before Apollo 11, but a few months after Apollo 8, when humans first ventured into lunar space and saw Earth above a moonscape. As I've mentioned here before, until we saw Earth from deep space we did not even know what our homeworld looks like – a planet of sworled blue and white, now so familiar, often with barely a hint of the land surface. The space and environmental movements have not been on the best of terms, at any rate in the US, for a variety of reasons. Space boosters are big and noisy, not in and of themselves a particularly 'green' technology, but environmentalism as we know it would have been impossible without them. I first learned the word ecology from Heinlein books, and 'spaceship Earth' remains about as good a summary of environmental concerns as anything. If the life support system goes blooey, it is Houston that has a problem, along with every other place where humans now live. Environmentalism as we know it is a child of space travel. And since Apollo, only the tragedies have been spectacular. (Well, any space launch is spectacular, but you know what I mean.) The successes have sort of sneaked up on us; it was a few years into the ongoing operation of the International Space Station before it fully hit me that we have a permanent space station. Half a thousand people have gone into space, for up to months at a time. And the ISS is, among other things, a sort of tethered interplanetary mission. It doesn't look at all like our 'classical' bike-wheel image of a space station, but if you clapped a drive on one end it would look a great deal like an interplanetary ship. It has operated for nearly a decade with no critical emergency – the single most vital benchmark for going to Mars, or anywhere in the Solar System. Long duration spaceflight is achievable, not just in theory but in practice. We have taken high specific impulse drive out of the lab and into space, flying deep space robotic missions using electric drive. A lot of development is need to scale it to a human mission, but we know that it works. Small step by small step, we are heading toward that first step onto the surface of Mars. 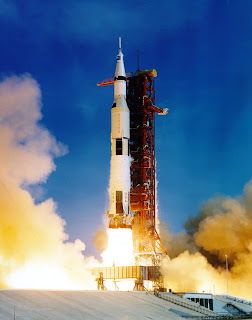 Related links: Last year I reflected on the 39th anniversary of Apollo 11, and also – quite by coincidence – on the significance of space travel for our understanding of Earth. Forty years ago they launched a rocket to somewhere or other. Three terrestrial transportation mishaps recently in the news have called attention to the challenges facing human operators of highly automated systems. In Washington DC a subway train under automated control collided with another train, killing several people including the key witness, the train operator aboard the moving train. [Link may require free registration.] At about the same time, the investigation of a 'commuter' airliner crash in upstate New York concluded that the pilot failed to respond to a critical control input during a semi-automated landing approach in bad weather. And a highly automated Air France Airbus crashed in the mid-Atlantic after a cascading series of computer failures. The first and last of these accidents are still under investigation, and unless the 'black boxes' are located and recovered from the ocean floor we may never have a full picture of what happened to the Airbus. The commuter plane crash was due to pilot error, and the training and working conditions of the crew may be implicated. But all three accidents seem to involve the human-machine interface – specifically, what happens when humans who normally are only along for the ride suddenly have to take charge. A previous Washington subway collision investigation revealed that train operators had been specifically directed not to take the controls themselves. Whatever happened this time, we can guess at minimum that the operator had not been controlling the train during its pre-emergency run, and either did not recognize the developing emergency in time or had been told to ignore potential warning signs (such as trackside signals). The commuter plane's control column began vibrating, a stall warning, and the pilot 'instinctively' pulled it back – putting his plane into a full stall – instead of pushing it forward to get the nose down and regain airspeed. The Airbus was at cruising altitude, the crew almost surely not handflying it, when computers went out. We can only guess that the cockpit became a desperately 'busy' place, the crew frantically trying to fly the plane on backup instruments in turbulent weather at night, while also trying to reboot the computers. In all these cases, the humans had (probably) been largely hands-off … till all hell broke loose. The resulting problems have been dubbed the automation paradox. I have experienced a minor form of this myself, while driving on cruise control on a largely empty highway. A sharper curve comes along, or enough nearby cars appear to become 'traffic,' and I suddenly have to go off cruise to change speed. The experience is slightly jarring – and in these cases I had my hands on the wheel, alert, already involved in driving. It would be far more jarring if the car were fully automated and I wasn't driving at all until I suddenly had to take control. The implications of all this for space operations are fairly clear. Most of the time, in space, there is no call for 'piloting' of any sort. Spacecraft on orbit stay on that orbit. Even when accelerating, especially with a milligee deep space drive, there is rarely much reason to take the controls. But rendezvous and docking are a different matter. I suspect that as space travel becomes common, a common type of accident will be low speed collisions – which can easily be catastrophic, since 'low speed' is up to tens of meters per second, comparable to highway (or subway) speeds. One such low speed collision has already been experienced, happily without catastrophic results, when an unmanned Progress supply craft banged into the Mir space station. In that case, as it happens, a cosmonaut aboard Mir was handflying the Progress by remote, and misjudged the docking approach. But avoiding all handflying is no perfect solution. I have done enough coding to know how elusive bugs can be, and there is also such a thing as hardware failures. So how do we deal with the automation paradox in handling spacecraft in close proximity to each others, or other situations (such as planetary landings!) where sudden emergency control inputs may be called for? It goes without saying that the humans involved need to train and practice their emergency procedures. But I am inclined to suspect that that positive handflying may be the better procedure, so that if an emergency arises the human is already in the loop, and doesn't suddenly have to shift their whole mental set to engage in emergency response. This does not preclude automatic override, e.g., a retroburn if a docking approach goes out of parameters. This in turn can be over-overriden by the pilot, if the override system itself goes haywire. The control station will be a busy place, but with humans who were already actively engaged in the process. The comment thread is open for discussion! Related link: Comments on my recent piece about the Singularity led to a discussion of automation, AI, and their implications. And by the way, if you're not reading the comments you are missing a lot of the substance of this blog! In the astronomy news, Sky and Telescope reports on possible evidence of 'midsized' black holes, one of which may be in globular cluster M54. Which, as it turns out, may be not just one more of our own galaxy's globular clusters, but perhaps the nucleus of a dwarf galaxy in the process of being torn apart by its overly close relationship with the Milky Way. And don't forget this week's Star of the Week, Rho Aquilae. Back by popular demand! I have not updated the Tough Guide to the Known Galaxy since I wrote it, but this begins a new sporadic series. I will add entries here, and (perhaps!) in due course as an addendum page to the original. So here we go! The SINGULARITY has not happened anywhere in the Known Galaxy, at least not to Earth Humans. This is for two reasons: one plausible, the other decisive. The plausible reason, as with the decline of Robots and AI since the Golden Age, is niggling doubts about whether the thing could really happen. Computers are Really Fast, but not really all that bright, and it is not a bit clear how to make them brighter than we are when we haven't a clue how the human brain does our thinking for us. Of course, plausibility problems alone would not stop SF. (See FTL.) The more serious problem, the decisive one in fact, is that the Singularity is an ultimate story killer. Its end result is a world as incomprehensible to us as, say, financial securities regulation would be to australopithecines. There's just enough room, barely, for some bittersweet awe, as Clarke managed in Childhood's End (a sort of proto-variation on the Singularity theme). But the Singularity provides little room for straightforward adventure and none at all for sequels, both of them the lifeblood of the Known Galaxy. But a Singularity-like event may well have happened to some other race, in the Cosmic Background History. This provides a handy source of godlike beings who, being godlike, have the good sense to stay mostly offstage, turning up only when the author needs them to hustle the plot along. Related links: My speculation about the nature of science fiction. Nova Terra, to be sure, was the pick of the lot. In the same book Heinlein alludes to harsh colony worlds – and later on, an Eden planet turns out to have non-prelapsarian locals already in possession, who intend to stay that way. But given a sky full of stars and a ship to get you there, why settle for the also-rans? Heinlein also supplied a host of secondary tropes, such as the utility of horses that can fuel themselves from a handy pasture and (given a stallion and a mare) manufacture their own replacements. Unfortunately, as commenter Ian M. noted a couple of months back (in comments spinning off a post about the Moon), it is desperately unlikely to work out that way. Suppose a planet with complex life, and enough of it to have built up an oxygen-rich atmosphere. It may look like Paradise, or at any rate Earth. Convergent evolution might well produce para-forests and para-grasslands, just as dolphins have a similar configuration to fish. But dophins aren't fish, and alien life almost certainly will not be like us. Hydrocarbon life anywhere will be built out of the same basic building blocks, but with differing architectural details – and our digestive keys will not fit its nutritional locks. The good news is that the local tigers and local germs won't find us tasty and nutritious. But by the same token we can't eat the local venison or berries, and chances are only slightly better that our cattle can graze on the grass. Plants have a far less demanding diet, and might well grow nicely in any soil that has nitrogen fixed in it. In fact they might grow too well, at least the ones that don't rely on bees or other terrestrial creatures as their dating service. Terrestrial plants, devoid of natural enemies, might crowd the native stuff out of any remotely suitable environment – wrecking entire ecosystems. But this too could go both ways. To local para-algae we could be walking Petri dishes: warm, moist, and fertile. Our bodies' defenses, if any, are likely to take the form of allergic reactions, not terribly helpful to us. In short, any garden worlds out there are probably not for us. Those valleys with forested slopes above babbling streams filled with flashing para-trout are the ultimate nature preserves, to be appreciated but not subdivided for housing tracts. Yes, theoretically we might simply wipe out the native life, then recolonize with a terrestrial ecosystem including ourselves. I don't think you have to be a Jain to find something repulsive about this. Which leaves the option of terraforming. For every nature-park world we will probably find dozens that didn't quite make it. We do not yet know whether life arises wherever there is liquid water to be had – we may begin to find out on Mars and Europa. But if a planet has oceans but no life it is a candidate for terraforming, and only the ecopoetic or gardening stage is required – no need to sling comets from the outer system to provide water, or hoover up 90 bars of CO2 out of the atmosphere. Worlds with limited 'primitive' life may even allow a sort of biological nonaggression pact, the native forms going quietly on in their own local ecosystems. There are still ethical questions (we're precluding or at least greatly altering their evolutionary prospects), but not like the ethics of sterilizing a rich, living world. Yet even interstellar colonization is not as simple as it used to be. Related post: In the early days of this blog I commented on the largest-yet (still!) discovery report of extrasolar planets. 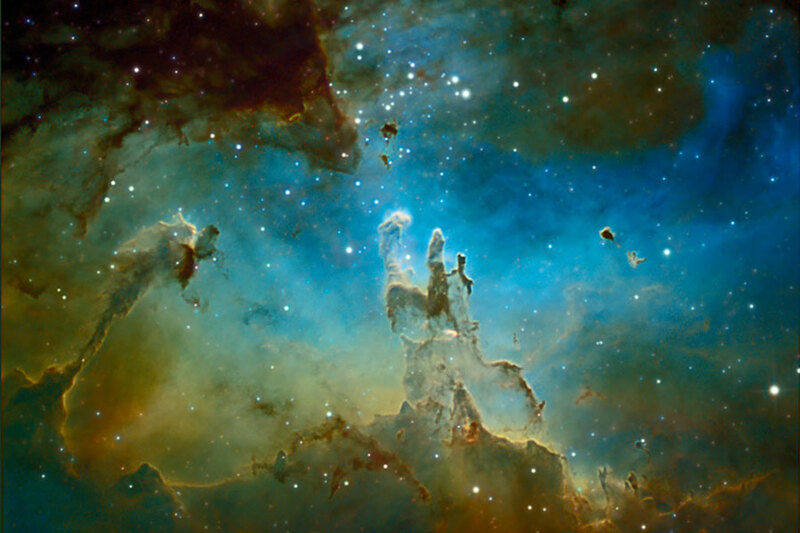 In space everything is moving, and all motion is relative. Hollywood naturally ignores this, with good reason from their perspective. With a handful of honorable exceptions, such as Babylon 5's Starfuries, media spacecraft move like airplanes or sea vessels, and when their drive engines fail they 'stop.' This Aristotelian physics, in fact, matches the universal human experience, with partial exception for the 499 people who have so far traveled into space. Like the planet Mercury, real spacecraft do not move according to Newtonian physics. But unless you have an antimatter drive or some such, Einstein can be ignored (at least for navigation and maneuvering). This is fortunate, because dealing with Newton is complicated enough. Whatever their drive (so long as it is non-magical), spacecraft move not like ships or airplanes, but rather like self-propelled artillery shells. Once they fire themselves into a particular orbit they can change that orbit only by another burst of power, expending more propellant in the process. (With the one exception of using a planetary atmosphere for 'aerobraking.') A task force headed, say, from Earth to Mars probably has reserve fuel for an abort option: an orbit returning to Earth, or to some friendly base. It probably does not have enough reserve to change orbit and attack Ceres instead - at least not without cutting dangerously into reserve margins, and likely not even then. Fuel supplies and possible orbits will thus dominate every aspect of space warfare. In the familiar expression, amateurs study tactics while professionals study logistics. In space even amateurs ignore logistics at peril of finding themselves on orbit to nowhere. Assuming you avoid this and are on orbit to somewhere, if it is a hostile somewhere you will have a fight on your hands once you arrive. Unless you perform an abort maneuver, arrive there you most certainly will. And you will arrive at impressive speed, relative to an enemy on a different orbit. Even economical (and sluggish) Hohmann transfer orbits imply typical encounter speeds of a few kilometers per second. If you take a fast, 'steep' interplanetary* orbit, encounter speeds can be dozens of km/s, on up to whatever your drive tech allows. If you intend to stick around wherever you are attacking (as opposed to a 'drive by' raid), you may perform your orbit-matching maneuver before arriving in fighting range of the enemy, and encounter speed will be lower. But if you are fighting anywhere near a planet, its gravity well also has to be taken into account. Generally, unless the two sides tacitly agree to match orbits before the shooting starts, encounter speeds of at least a few km/s will be the rule. Which brings us to tactical maneuver. The maneuver characteristics of spacecraft correspond roughly to the mathematical first derivatives of their terrestrial counterparts. Range, in the sense of cruising radius, hardly exists as a concept. Whatever your orbit, you will stay on it indefinitely until you change it or run into something. What a big fuel tank (or potent brand of fuel) gives you is not longer range but greater speed, the first derivative of motion. More precisely it gives you more delta v - the capacity to change your orbit. What a whomping powerful drive engine gives you is not speed but acceleration (the first derivative of speed): the ability to change orbit abruptly. For a given power output there is a theoretical tradeoff between delta v and acceleration, in engineering terms specific impulse and thrust. For chemfuel this doesn't matter in practice, but for advanced drives it could be important. Some proposed drives, notably VASIMR, can operate in more than one mode, providing the equivalent of afterburning (though based on an entirely different principle). Such drives might have a fuel-efficient but low-acceleration cruise mode for deep space missions, and a combat mode providing short bursts of high acceleration for combat maneuvers. All of which suggests that - absent other complications - space tactics may have somewhat the flavor of 18th century formalism: Constellations of space warcraft approaching each other in well-defined formations, their engagements unfolding with the stately grandeur of a battle between mobile Vauban forts. Combined with the inexorable quality of space motion - no calling a halt to think things over - this formalism could make space battles rare. If you are outgunned, clever shiphandling probably won't save your bacon. If you are the attacker, think long and hard about that abort orbit. If you are the defender, this might be a good time to seek mutual understanding through dialogue. Perhaps you can talk faster than the other side can shoot. But what, you may ask, are those 'other complications' that could add a dash of dash to the mix? The most promising of these is a battle in orbital space, amid a clutter of civil spacecraft and stations that neither side is eager to destroy. Why the defender would prefer not to wreck their own infrastructure is obvious. Why the attacker might wish not to destroy these things will, for now, be left as an Exercise for the Reader. Suffice to say here that orbital combat near a planet has a multitude of complications that make it potentially both quite different from and more interesting than battles in deep space. * For this discussion, enroute to or from a wormhole or other FTL jump point is just another interplanetary orbit. ** In the older, broader sense of Romance; the issue has no obvious bearing on love affairs. Related links: A general discussion of interplanetary movement. And as always, Winch Chung's Atomic Rockets pages are a treasure trove of relevant information and commentary (plus a century of SF/space related eye candy).